Suddenly we stop in our tracks. It's a magnificent sight, a heart-in-mouth moment. 150 feet away from us, half hidden within the electric green beech and hornbeam forest, are a brown bear and her two cubs. The youngsters quickly spot us and come careering down the slope to inspect these strange bipeds. The mother is too busy foraging through leaves the color of burnt tobacco to notice us. The cubs come and go for a few minutes, gamboling up and down the hill. Then the mother catches sight of us. She stands up on hind legs for a better look and the atmosphere changes in a flash. Cuddly bear becomes massive predator about to attack. I grab a sturdy length of wood and prepare for the worst. We've heard tales of a villager who lost half his face in a bear mauling; of horses maimed by swiping claws. Then, with a last stare at the forest intruders, the mother turns around and the trio lollop off up the hill. The danger – and a magical moment – is over. "You were very lucky," says William Blacker when we see him a few days later. The author of Along the Enchanted Way, a much-admired story of his many years in Romania, has never seen a bear in the wild. We are in Zalánpatak, in eastern Transylvania – "a one-word poem", according to the doughty travel writer Dervla Murphy – in the heart of Europe's last great wilderness. This is a rolling land of ancient forests of oak, beech and hornbeam, wide meadows and mountain pastures filled with wild flowers, villages where cows are the most numerous pedestrians and transport is a horse and cart. Wolves, wild boar and deer roam freely in the woods, eagles and buzzards patrol the skies, while storks maintain a languid village lookout from giant nests stacked on chimneys. Caught up in numerous conquests and invasions, Transylvania has been successively ruled by Romans, Magyars, Habsburgs, Ottomans and Wallachians. Once part of Hungary, but Romanian since 1918, its mixed population of Romanians, Saxons, Gypsy, Magyars and Székelys – reflects this very particular, convoluted history. 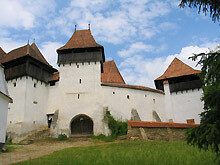 And yes, for those who like Gothic horror novels, Transylvania is also the playground of Count Dracula, but be warned. The local population – with the exception of purveyors of Dracula tat – give the fictitious vampire short shrift. "We don't like all this stuff about Count Dracula," says Joszef, driving us across scenes of simple, bucolic splendor one afternoon. "It's ­nonsense." Of course it is. And who needs Dracula anyway, when there are real-life counts, castles and crags, towers, turrets, bears and bats, not to mention mist-wreathed valleys and more folk legends than you can shake a stick at. 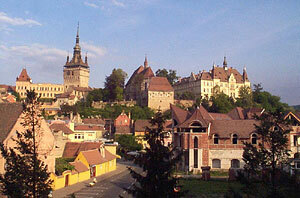 If you really must connect with your inner vampire, drop in on Sighisoara, a medieval Saxon fortress town and Unesco World Heritage site, birthplace of Vlad the Impaler, son of Vlad Dracul (Vlad the Dragon) whose name inspired Bram Stoker's blood-fanged creation. Before you can reach the pastoral idyll of Transylvania, however, most visitors first pass through Bucharest, which it would be a pity to miss. Though lacking in the imperial swagger and architectural chutzpah of Budapest, 500 miles to the north-west, the Romanian capital is a pleasant, surprisingly green city of broad, tree-fringed ­boulevards. One of its main attractions is also its largest. 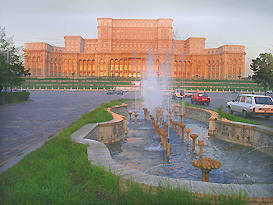 The Palace of the Parliament is an impossibly vast monument to one man's hubris. A million cubic metres of marble, 700,000 tons of steel, 3,500 tons of crystal; the palace's vital statistics are as astonishing as the sheer scale and weirdness of the place. It was the megalomaniacal vision of the Romanian dictator Nicolae Ceausescu. Our guide, a fierce young woman with jet-black, braided hair, may not have been born when Ceausescu was executed during the 1989 revolution, but she certainly shares the new generation's contempt for him. "There isn't a single picture or statue of Ceausescu anywhere in the building," she says, the tone as arched as her eyebrows. "I guess nobody wants to see him." Asked about religion in Romania under the communists, she shoots back: "Ceausescu didn't like religion. He thought he was the only god worth worshipping." After the head-swiveling strangeness of the palace, Bucharest's Old City is a welcome counterpoint of cobbles, quiet churches and cafe terraces. Long neglected, the historical heart of the city, which dates back at least to the 15th century and was home to Wallachian princes for 400 years, has been sensitively restored. When you tire of exploring here, head to Caru' cu Bere, winner of the Best Romanian Restaurant award in 2013, for one of the heartiest dinners of your life, solid preparation for the journey north-west to ­Transylvania. Of the steady trickle of visitors who come to discover one of Europe's best-kept secrets, a high proportion find their way to Count Tibor Kálnoky, who comes from an old Székely Hungarian family. He manages three handsomely restored properties in Miklósvár, Zalánpatak and the Saxon village of Viscri, the latter two on behalf of the Prince of Wales, who has taken a keen interest in Transylvania, attracted by an ancient community living in close harmony with nature. Bedrooms have dark, coffered ceilings, exquisitely embroidered bed linen and elegant, ceramic, wood-burning heaters that warm tired limbs after long hikes through forests and pastures. Food is simple, local, fresh and shared among fellow guests. Dinner conversations among foreign visitors – Dutch, German, British and American during our visit – exhibit common surprise that somewhere this beautiful and unspoilt still exists in Europe. One thing that many visitors also have in common here is an interest in the English travel writer Patrick Leigh Fermor. In the summer of 1934, as part of his epic trudge from the Hook of Holland to Constantinople, he spent "a blessed and happy spell" in Transylvania, "the very essence and symbol of remote, leafy, half-mythical strangeness". "It's just so timeless," says Kálnoky. "You can feel the history everywhere. When I started, I had to buy back the ruins of neglected village houses. We opened up these guesthouses to restore the heritage, provide jobs and raise funds. It's a niche thing, and very unique. We have more employees than beds." If Kálnoky provides one aristocratic Transylvanian welcome, another comes a few miles to the east at Zabola, an estate belonging to the Count Mikes family in the foothills of the Carpathian Mountains. Here, Countess Mikes and her two sons Alexander and Gregor are still picking up the pieces of the bitter communist legacy. A quarter of a century after the fall of Ceausescu, property restitution remains an ongoing business. Here, as in Miklósvár, Zalánpatak and Viscri, one of the answers to post-Soviet economic decline is small-scale tourism. Forest-lovers can head to the hills that rise immediately behind the main house, accompanied by the resident, honey-colored dog Brie, who will help guide you along many miles of trails. The highlight of the restored 18th-century Machine House is the elegant Red Room, with enchanting views into the forests. Black-and-white pictures around the house – elegant country picnics, hunting parties in immaculate costumes, state-of-the-art forestry machinery – are a reminder of more prosperous times for the Mikes family. It's a short, if bumpy, journey – Transylvanian roads can be fairly rudimentary – to the Saxon village of Viscri, where the charismatic Caroline Fernolend, the director of the Mihai Eminescu Trust, has managed to transform a dying village into a sustainable community. Saxons first arrived in Transylvania in the 12th century after being invited by the Hungarian king Géza II to colonise and defend the area from eastern invaders. In his quest for "standardisation" in the 1980s, Ceausescu proposed to demolish thousands of villages across Romania. Though he was unable to accomplish that, the ancient Saxon community in Viscri, lured by suddenly available exit visas, plunged from 300 people to 40. Across Romania as a whole, 500,000 fled to Germany. Faced with a community on the brink of extinction, Fernolend, whose family has been in Viscri since 1141, mobilised the Gipsy community to occupy and take care of the empty houses. With the active support of the Mihai Eminescu Trust, backed by the Prince of Wales, Viscri has become a Unesco World Heritage site and an inspirational, award-winning model of historic conservation and economic regeneration. One cannot happen without the other. Fernolend takes us around the wonderful church, a medley of fortifications, towers, bastions and even a room in which families once hung their hams. Rising above the village, it provides a striking architectural reminder that these were once Europe's easternmost borderlands, vulnerable to attack by the great warriors of the steppe, rampaging Mongols and Tatars hellbent on conquest and slaughter. Fernolend tells the story of how, after the collapse of the communist regime, she was reunited with fellow Saxons from Luxembourg. "We found we spoke the same language after 800 years," she says. "It was so emotional, we were all crying." She surveys the straggling street of pastel-coloured, lime-washed houses with a tear in the eye. "I'm so proud of what we've achieved here."